Adam Broderick – Adam Is Stoked! Writer/editor, photographer, trail runner, mountain biker, surfer, father to an American Yellow Labrador, lover of all things wild and adventurous. Sunrise, sunset. A good IPA. If you’ve already read the first half of this on Instagram or Facebook, scroll down past the second image to pick up where the social media character limit originally cut me off. Tessa, looking lovely as ever, at around mile 17. Yes, that’s Rowdy coming in hot behind Tessa just before the finish. Not long before the race I spent a day circumnavigating Mt. Hood on the Timberline Trail. I’m glad I was able to experience the stratovolcano from both perspectives. Fortunately, I didn’t have to pop that myself. Rowdy stepped on my toe and took care of it before I had the chance. With more training and less obstacles, I think I could do better than 8:50/mile avg. Maybe next time. The past few months have been overwhelmingly awesome. Sure, I took a new job that I’m extremely stoked about, but more on that later. Here, I’m referring to the amount of work I put into a dance performance and the amount of pride I took away from feeling it all come together after the past few months of hard work. And no, I never thought I’d hear myself say that. Well, the good feelings as a result of hard work part, yes, but not the dance performance part. It’s wild to think back a few years and compare that place to where we actually ended up, especially when life moves so fast. I definitely didn’t think I’d be co-choreographing a 50s rock dance for four nights of sold-out shows in front of literally half our town. Nor did I think I’d play a part in a passionate, heart breaking tango duo and have all eyes on me…err, us. One of our favorite moves. It was all about the leg wrap and her trusting I would catch her. I did the math as the show approached, and with it nerves. 260 seats x 4 shows = 1040. That’s literally half the population of Crested Butte, Colorado. Fortunately, it’s one of the more open-minded and inspiring towns on the planet. At least, so say a world traveler or two (or twelve) that I know well. It’s tough to get on stage in front of that many people, whether knowing any of them or not, and enact what has been practiced behind closed doors for months on end. And it’s reassuring, to say the least, to hear the positive feedback afterward. Daniela Runge and I choreographed two dances for Move the Butte 2016. We began with tango and the second dance sort of formed itself. I remember when she asked me to partner with her. We hit it off on a downtown dance floor one night last fall and she asked me to join her in tango for the community’s annual theatrical performance. Sure, why not? I had no idea what I was getting myself into. We met a few weeks later to outline our routine. It began with a vague understanding of what we (she) wanted to try and pull off and improved very slowly. For some reason, while practicing tango during one of our twice-per-week sessions, I threw out another idea. Twist – We took moves from the Pulp Fiction scene with John Travolta and Uma Thurman. Just kidding. That’s not what I said verbatim. I don’t actually speak that well. I use words more like “dude” and “bro” and “dope”, and phrases like “Dudebro, that’s dope.” So I can’t recall exactly how I suggested the new routine but I do remember throwing the idea out there, then Daniela coming back the next week with a list of interested dancers who wanted to make it happen. “So…you’ll be my partner, right?” she asked me. “Sure, why not?” I replied, somewhat reluctantly. I had been thinking something farther down the line, like next year, but what the hell. Why not add yet another project to the already chaotic honey-do list? In addition to our tango piece, we worked together for three months to choreograph two dance routines that many people we see on a daily basis would eventually pay to watch. Little did I know we would recruit such a fun group of dancers for such a fun, energetic piece. And little did I know how awesome it would turn out to be and how much I would truly enjoy being onstage, amidst all that action, moving to nothing but muscle memory and some really good tunes from our parents’ youth. Lindy Hop – fast feet and big, bright smiles were the name of this game. We practiced both the tango and Jukebox biweekly for three months straight. Daniela and I met twice per week for tango and the Jukebox squad met once per week for 50s dance. We called the 50s rock piece Jukebox, and we even had a life-size plywood jukebox painted in great detail the best plein-air artists in the valley. Since there were four audio clips from different musical genres strung together, each about 40 seconds long, we needed a way to blend together without missing a beat. Having dancers visibly skipping songs seemed like a good solution and placing a jukebox prop on stage worked perfectly. We studied at YouTube University and relayed what we learned to the other dancers in our squad. It was awesome watching everyone learn the steps and fine-tune all their unique additions to the routine. Thank you SO much to our fellow dancers. Stephanie Marziano, Brian Barker, Sasha Cuchadoff, Carson West, Shawn and Dawn Horne, Zack Gustafson and Wendy Fisher, you helped make a dream reality and I’ll never forget the experience we created together. We danced the Jitterbug, the Twist and the Lindy Hop, and us guys learned to disconnect our hips from the rest of our bodies and move with rockin’ rhythm like Elvis Presley did when he revolutionized live musical performances and forced young women to wear Velcro shoes so their socks wouldn’t be knocked off. Some of our moves were challenging and some others, extremely difficult. Most of us were scared, at least a bit, when we imagined ourselves doing it all on stage for a packed house. I loved watching the group progress as a whole and learn to have faith in them selves as well as in one another. That, my friends, is something to take pride in and worth pursuing for the greater good. It’s a bummer to think that it’s all over. I will miss our weekly dance practices. I will miss the tacky 50s smiles (is that generationist of me?) and the polka-dot dresses, but the swingin’ steps and aerial maneuvers should stick with me for years to come. As for tango, I only know some basic steps but they’re steps in the right direction and I imagine they’ll shine through whenever I participate in partner dances from here on out. I must give credit to Daniela, my beautiful Argentinian dance partner for her instruction and patience as I learned to keep my “white boy moves” at bay. Tango is not an easy dance. It requires moving with confidence and maintaining a formal, structured composition. My ultra-white hips and shoulders took a while to adjust to such little swagger but once I got it, it stuck. Photo taken during dress rehearsal. My left leg should have been straightened but my knee was sore from snowboarding and we should have been looking at each other, not down. That’s just some of the viewer feedback. A video would be ideal, but we don’t get to see that for a while so these will have to suffice for the time being. Yea, we looked damn good. Video taken during dress rehearsal. Our routine wasn’t perfect, but close. It improved with each show over the next three nights. Please excuse the blur and the head that blocks our feet. This was the only video we could acquire. No, I didn’t get a luxurious all-terrain vehicle for free. But I did wake up this morning to find my work on Land Rover’s content site. The site is called Discover the #Undiscovered, and it’s full of cool, creative articles and beautiful landscape photos all aiming to compel people to rove the land. In a Land Rover, of course. Perhaps I should have told swap between my Subaru and a somewhat conspicuous creeper van. Click here for my top four stateside suggestions for Land Rover clientele planning to backcountry ski and snowboard during the spring. There are many ways to do something awesome. You could do something to benefit yourself, or do something to benefit someone else. I believe this is a healthy practice and that if we were to only strive for one thing in life this should be it. Henry David Thoreau said, “Surely joy is the condition of life.” I know because Mom had that quote on a car bumper years ago. Thoreau was a smart man. Surely he implied that the goal of finding joy for oneself, aka the pursuit of happiness, is equally as important as promoting joy for others. Whether that mean believing that happiness is infectious and sharing one’s own happiness with others, or promoting unobstructed paths to happiness for those around you. I’ve been having trouble sleeping past 4 a.m. This has been ongoing the past nine months or so. This morning I opened my laptop in bed to write something a friend mentioned yesterday, but just couldn’t remember what it was. My brain then started wandering and I somehow thought it would be a good idea to write detailed descriptions about three different events from when I was a late teen…and found myself running from police. Keep in mind I was young and dumb and full of ___ when all this went down and that plenty of kids get into plenty of trouble before blossoming into mature, respectful and admirable adults. Event 1 – The cops chased a handful of us down Garden Road in Poway on Halloween night. I forget what we were doing but I doubt it was all that bad. Cops in the Garden Road neighborhood were known for hassling high schoolers for silly reasons. Anyway, we started running and I remember taking my shoes off to run faster. Now I wear running shoes on the regular because they’re most supportive, but back then I wore skate shoes and probably too loose because that’s how they looked coolest. So we’re running down the street, shoes in hands and two cops on foot maybe 50 feet behind us. Dan turned right down a side street but we didn’t follow. He was probably going to make his way home. The cops stayed with us. We eventually turned left, and were moving fast so by this time they were trailing about 100 feet behind. We decided to try and lose them by crossing through a few backyards toward the main road on the opposite side. We bolted up someone’s front lawn. I took the fence to the right. Jared took the fence to the left. I jumped over and dashed toward the back of the yard. Jared jumped over and landed on a doberman. Literally landed on top of a huge black dog. I heard the dog squeal, then snarl, then heard Jared cussing and scrambling to get away. The homeowner must have been nearby because all the commotion brought him outside in a heartbeat. Or more like five seconds, so in this case 50 heartbeats. And since the cops would have been out front by now they were quick to respond. So were we. I was already scaling the next fence when I heard the cops talking to the homeowner and the homeowner trying to calm his dog. After a couple more fences my feet touched sidewalk. Jared popped out onto the sidewalk behind me and jogged to catch up. We walked casually toward the convenience store on the corner. The cops must have stayed with the homeowner to do detective work. Nothing ever came of it. Event 2 – We got caught smoking near the loading dock of the Poway Industrial Park in San Diego. The guy was in a big security truck, not a squad car, so we weren’t sure how bad the situation actually could have become, but since he tried so hard to catch us we imagined he meant business. He came up from behind our parked car and flashed his lights. Brandon panicked, booked it around the building in his ’87 Honda Prelude (Lowered + 15” rims = ghetto fabulous. Brandon thought he was thuggish ruggish.) and screeched a left onto Industrial Park Blvd. Matt rode shotgun, and since it was his first time getting high in a couple years he was probably extra paranoid. I glanced back and forth from front windshield to rear window, scanning for hope among any obstacles ahead and checking on our pursuer’s progress behind. As we turned right on Pomerado Rd he was almost on top of us, but Brandon lived nearby and knew these backroads well and if he could pull off this next move…We were going roughly 50 mph…he hit a hard right turn up a one-way street in the wrong direction…pulled the e-brake…slid sideways to our left…hopped up the curb and over the six-foot-wide median…and gunned it up the one-way residential street. As soon as I could upright myself in the backseat I looked back and saw our pursuer’s vehicle coming to a stop shortly past the turn and realized we now had a moment to escape. We turned left, right, left, then another right, parked a half-block from Brandon’s house and ran inside. I forget the lie Brandon told his mom as to why we were so short of breath. Nothing ever came of this chase either, but Brandon had to replace his rear left wheel and Matt may have had to throw out his drawers. Event 3 – Then there was the time we were chased through a flea market in Tijuana. That was probably the scariest chase because one of the last places you want to end up is in a Tijuana jail cell. Eric, Ian and I had spent a long night in North County San Diego and the next day Ian wanted to drive to Mexico to buy some pharmaceuticals. He knew that many of the “pharmacists” in Tijuana would help him consolidate two bottles of pills into one container to minimize shaking so he could sneak them back across the boarder undetected. Eric and I were hungover from a big night and decided to tag along, with a shared goal of street tacos and one-dollar Coronas. It was probably 90 degrees out and all we wanted was tacos and cold beer. But our taxi driver wanted to make money off of Ian, so we rode along his “amigo’s store” where he could get the bargain Tyler demanded. He went inside and returned a few minutes later, empty handed but supposedly with “more amigos close by.” He tried two more spots with no luck and by this time we were much further into the heart of Tijuana than we wanted to be. It was an unfamiliar area and with less tourists around us we felt less safe. But the driver was set on making some dough off more than just a ride, and he assured us he would succeed in finding Ian’s pills if we kept following him. Screw that. We opted out and told him we weren’t paying for the one-way ride to nowhere. He’d taken us so far and hadn’t really went anywhere, but his meter kept ticking. So we walked away to find another cab. Turned out that was not the right move. The guy knew just about everyone around, including the three police officers just across the street. They all gave chase, so we picked up the pace. The Mexican police, our pissed off cabbie, and two random guys who must have known the cabbie were now in pursuit. We ran like bats outta hell…hungover, lost, nervous, and pissed at both Ian for trying so hard to score drugs and at ourselves for letting him try so hard. It was like a scene from a movie. We were flying through the streets on our feet, avoiding street vendors, children, chickens, three-legged dogs and pull carts. My most distinctive memory: the tapestries and all the rugs, sheets and towels that hung from the shack roofs as I blast through the flea market scared for my life. I found ways to pierce through the thick, woven tapestries without damage but the thinner sheets and colorful beach towels… I more like whipped through those, and can recall looking over my shoulder to see them falling to the ground as leaves fall from trees. That’s my last memory of that day. I think we eventually ducked into another cab, but can’t remember exactly how we escaped. I don’t even remember tacos or beer. Only the memory of all those flea market leaves falling to the ground. That time the party broke out of Scott’s place in Mission Beach when cops showed up and Mark got caught by his foot while jumping out the second-story window. He fell ribs-first into the fence below, which seemed a bit aggressive of the officer, then was tossed in the back of the paddy wagon with a fighting couple and wound up making out with the guy’s girlfriend. A few partiers were written up for Minor in Possession but the rest of us were fine and the next day Mark had a cool story to tell. That time the cop passed me driving with my head out the window (waking myself up), turned around and flipped on his lights. I was close to work and thought if I could make it into the warehouse parking lot I might avoid whatever nonsense he wanted to discuss. I even ran a stop sign at one point when he was briefly out of sight. But he found me sitting low in the very last parking spot behind work. Luckily I only received a warning. “Keep your head in the window.” When I exited my car, Cop Killer by Ice Cube was playing on the loudspeakers. Thanks, Brian. And then there was the time my brother and fought two guys at a college party in Chico, CA. I was sticking up for my little brother (who is 6” taller than me) and we ended up on the better side of that fight. My brother had a finger in a brace, so when the cops stopped us on our way out the door we said something like, “How could we fight? His finger’s broken. But there’s a fight going on inside right now.” The cops went inside and we high-tailed it down the street. And then there was that other time. Oh, and that time. But that’s about it. We were generally advocates of the legal system and definitely respectful of authorities. And nowadays when I run, leaves actually do fall around me, not just metaphorically. A friend and I did Hawaii earlier this summer. Brandon’s dad has a timeshare in Kona on the west side of the Big Island, so we used that as base camp and adventured out, circumnavigating the island in search of the best time we could find. We found it. Then I wrote about it for Active Junky, which helped pay for my flight. After several months I began to wonder when I would see my words and photos online, then they appeared on Active Junky’s Facebook page. Brandon snapped this shot of me running across the caldera through rain and sulfur steam on the Kilueau Iki trail. 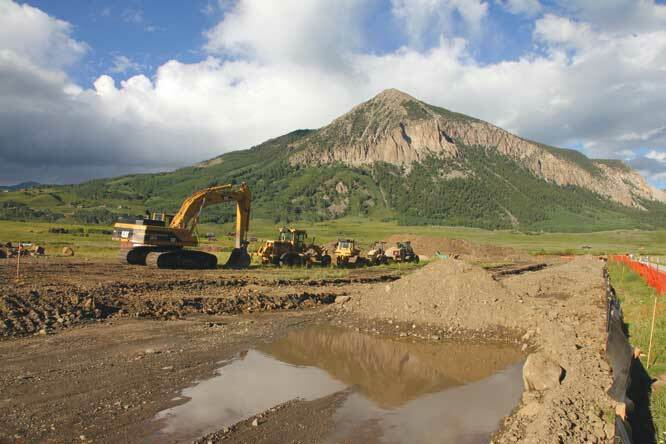 Blocks 79 & 80, site of future deed-restricted housing development in Crested Butte. This four-part feature series I wrote for the Crested Butte News discusses the affordable housing “crisis” currently faced by locals in many resort towns. I hope you’ll join me in this exploration of life, liberty and not-so-basic economics in beautiful communities that are quite literally being loved to death.